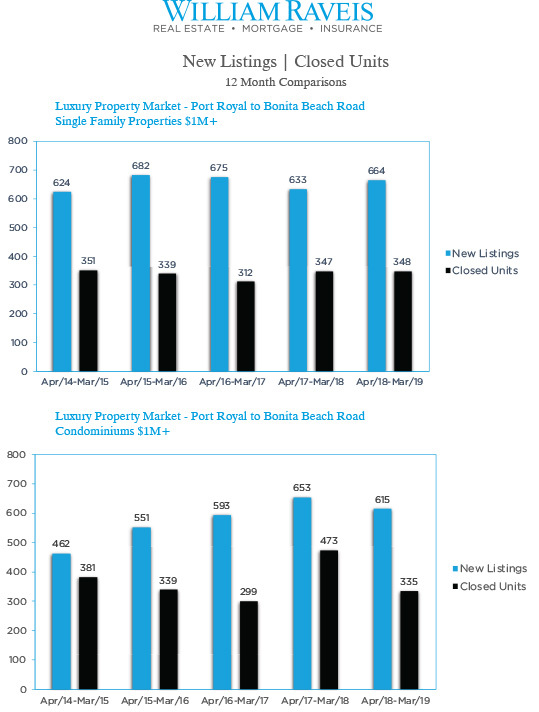 The number of closed sales in the 12 months ending March 31, 2019 for the luxury market from Port Royal to Bonita Beach Road area has remained relatively, the same with a decrease less than 1%, year-over-year (348 vs 347). During the 12 months ending March 31, 2019, a total of 664 new listings were added to the market, this is approximately 5% more listings than the same time period 12 months ending March 31, 2018. Available inventory as of March 31, 2019 consisted of 525 units, an increase of 7% vs the same time period in 2018. Current inventory represents 18 months of supply based on current absorption rates. The year-over-year average sales price for the area was $3,787,300, which increased 24% vs the same time period in 2018. The median sales price for the area decreased 15% to $1,662,500 vs $1,950,000 in 2018. 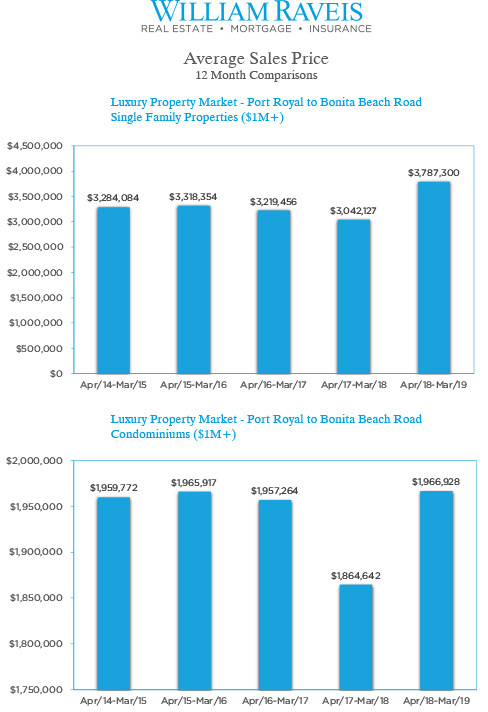 The number of closed sales in the 12 months ending March 31, 2019 for the luxury market from Port Royal to Bonita Beach Road area decreased 29% year-over-year (473 vs 335). During the 12 months ending March 31, 2019, a total of 615 new listings were added to the market, a decrease of 6% vs the same time period, 12 months ending March 31, 2018. Available inventory as of March 31, 2019 consisted of 463 units, an increase of 15% vs the same time period in 2018. Current inventory represents 17 months of supply based on current absorption rates. The year-over-year average sales price for the area was $1,966,928, an increase of 5% vs the same time period in 2018. The median sales price for the area increased 1% to $1,457,500 vs $1,410,000 in 2018.